A multicultural and economically diverse group working for international companies, the fur traders who came to Montana were all far from their families. Whether company managers, clerks, laborers, or trappers, the men sought companionship, intimacy, and entrée into local tribal communities, as well as assistance in making their economic endeavors a success. Marriage to indigenous women could provide all of these things. In keeping with tribal customs, traders arranged liaisons with indigenous women by exchanging gifts with tribal families, who themselves recognized the potential benefits of establishing alliances. Depending on both partners’ preferences, relationships lasted a season, many months or years, or a lifetime. Some indigenous wives returned to eastern settlements with their white husbands; some raised families together in the West. Whatever the specifics of their individual relationships, the important socioeconomic positions indigenous women held in their own cultures manifested in their contributions to the fur trade. Indigenous wives gave fur traders invaluable ties to the land and tribes. Their knowledge of the region’s climate, wildlife, plants, languages, and topography shortened considerably the male outsiders’ learning curves. At the same time, the women brought inside information to their tribes about the reliability of traders and prices while relaying tribal news to their white partners. Indigenous women also accomplished work fundamental to the survival of the fur traders and to their economic success. While incorporating European household goods into their daily lives (and thus making those goods more marketable), women in the fur trade continued to utilize indigenous methods to produce food and durable goods such as clothing, footwear, and blankets as well as baskets, parfleches, and other portable trade and traveling containers. Women also prepared hides, expertly cleaning and tanning them to command high prices. Notwithstanding the power they derived from being experienced locals, many indigenous wives faced adversity and tragedy. They had to learn new languages, navigate European cultural norms, and often adapt to unfamiliar dwellings. Separation from their families and the reality of living amid an almost exclusively male population caused particular hardship; fur trade wives lost the support and companionship of other women with whom, in their native societies, they would have shared the duties of daily work and child rearing. Living at fur forts also placed them at increased risk of sexual exploitation. In addition, close proximity to Europeans exposed indigenous women to many infectious diseases. In 1837, when a steamboat brought smallpox up the Missouri, they were among the disease’s first victims—and its first carriers back to tribes. 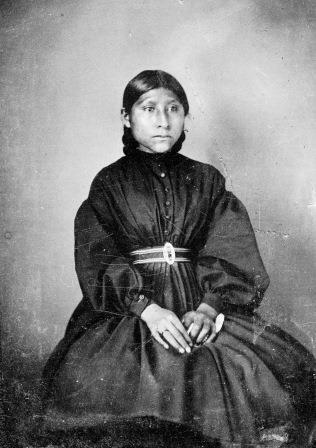 As missionaries, gold miners, and their families increasingly brought the strictures of Christianity and racial hierarchies to the West, indigenous wives faced greater prejudice. 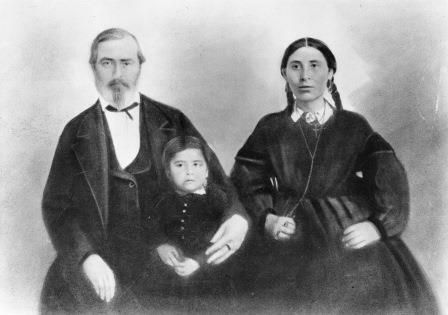 Montana pioneer Granville Stuart’s change of heart toward Awbonnie, his Shoshone wife of twenty-six years and the mother of his eleven children, illustrates the new quicksands. When Awbonnie died in 1888, Stuart prepared a funeral card that read, “And now may the birds sing above her . . . noble, devoted, self-sacrificing wife and gentle and loving mother, farewell.” Still, within a year, Stuart had remarried a white woman and begun formally excluding his mixed-blood children from his life. Looking for more about the Métis in Montana? Check out this Bibliography of Resources about Native American and Métis Women in Montana. Boller, Henry A. Among the Indians: Eight Years in the Far West, 1858-1866. Chicago: Lakeside Press, 1959 (1868). Brown, Jennifer S. H. Strangers in the Blood: Fur Trade Company Families in Indian Country. Vancouver: University of British Columbia Press, 1980. Graybill, Andrew. The Red and the White: A Family Saga of the American West. New York: W. W. Norton, 2013. Lansing, Michael. “Plains Indian Women and Interracial Marriage in the Upper Missouri Trade, 1804-1868.” The Western Historical Quarterly 31, no. 4 (Winter, 2000), 413-33. Meikle, Lyndel, ed. Very Close to Trouble: The Johnny Grant Memoir. Pullman: Washington State University Press, 1996. Milner, Clyde II, and Carol O’Connor. As Big as the West: The Pioneer Life of Granville Stuart. New York: Oxford University Press, 2009. Schemm, Mildred Walker. “The Major’s Lady: Natawista.” The Montana Magazine of History 2, no. 1 (January 1952), 4-15. Van Kirk, Sylvia. Many Tender Ties: Women in Fur-Trade Society, 1670-1870. Winnipeg: Watson & Dwyer, 1980. Wischmann, Lesley. Frontier Diplomats: Alexander Culbertson and Natoyist-Siksina among the Blackfeet. Norman: University of Oklahoma Press, 2004.